The first day of fall is just a day away. Are you as excited as I am? Fall is the best weather. It has the best colors and the coziest wardrobe. To welcome fall, why not make the perfect fall wreath for your front door to welcome guests to your home this season. Today, I’ll be sharing a tutorial on how I made a fall wreath for our front door that incorporates all of the aspects of fall that I love. 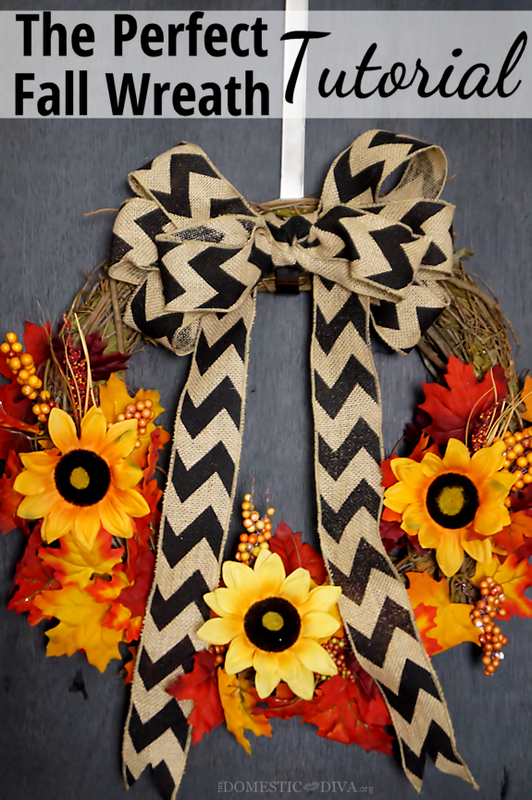 Beautiful fall colored leaves, vibrant sunflowers, and chevron printed burlap ribbon complete this wreath. All of the products I used to create this wreath can be found at Walmart so this wreath is also very budget friendly. Let’s get started! 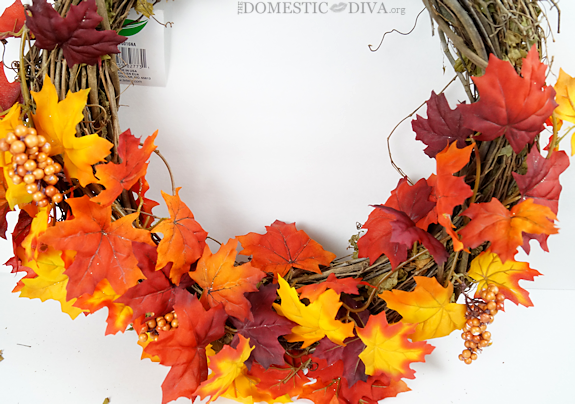 As soon as I saw this beautiful maple leaves garland at Walmart, I knew I just had to incorporate it into my fall wreath is some way. After all, the best aspect of fall are the beautiful fallen leaves. Right? 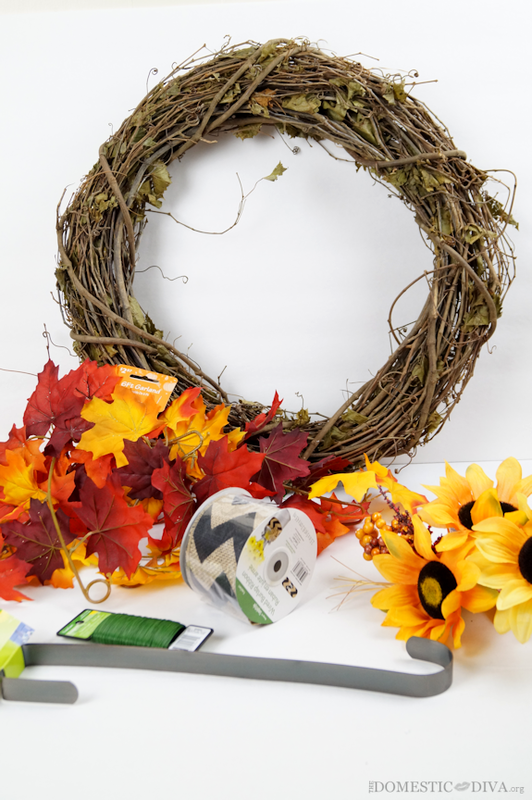 To get started, first lay out your wreath on your craft table. Take the red maple garland with floral wire and start attaching it to the grapevine wreath using floral wire. 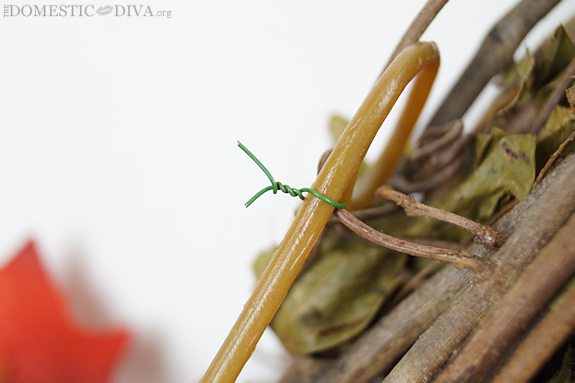 I just cut a small piece of wire and thread it underneath a branch on the grapevine wreath. Twist the wire to attach the garland to the wreath. Then bend down and cut off any excess wire that may be sticking out. Next, I saw these vibrant sunflower floral picks. So I picked up 3, my favorite number. Two were in a darker shade of yellow and one was a lighter shade. I arranged the picks on the wreath in the bare spots that I saw. To add them to the wreath I simply pushed the pick part into the grapevine wreath. To make it more secure one can also attache the picks to the wreath with floral wire. After the picks were in place, then you can bend the picks since they are made of wire so that the sunflowers are facing the direction that you choose. Next, it is onto adding the finishing touches to our wreath with a big beautiful burlap bow. I love that Walmart carries burlap wire ribbon in many different patterns from solid to this festively fun chevron. This burlap bow is simple to make with just one spool of ribbon and a little floral wire. Take your ribbon and lay it out on a table. Fold the tail of the ribbon over the center however wide your want your bow to be. Make sure to leave plenty of tail. Bring the other side of the ribbon crossing over the center of the bow, making a loop. 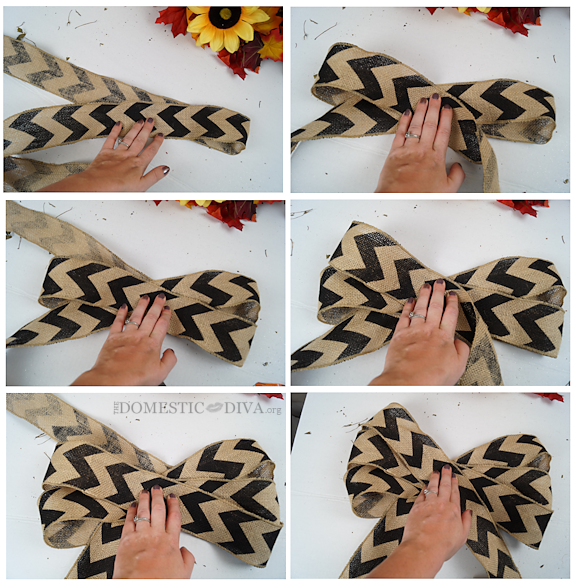 You want to make sure that the chevron pattern is always showing and not the underside of the ribbon. Bring that same piece of ribbon back over to the other side but instead of going on top of the bow, go underneath the bow to keep that chevron pattern showing. Loop the ribbon again and bring it across the front of the bow crossing the center. At this point you should have two loops on either side and one tail. Loop the ribbon a third time and bring it to the other side underneath the center of the bow. Make your final loop and bring the remaining ribbon across the center of the bow. Now you have 3 equal sized ribbon loops on either side. Cut off the excess ribbon the same length as the original tail that you created. Flip the bow over, and tie the loops together at the center of the ribbon with floral wire. Keep a lot of extra floral wire as we will use this later to attach the finished bow to our wreath. Push the excess wire to either side of the bow so that we can add our center loops. To create our center loops, with the excess ribbon that we had cut off tie the ribbon like you would a shoe lace in the center of the bow. Loop the remaining tails of this ribbon and tuck them into our simple knot to secure them into place. 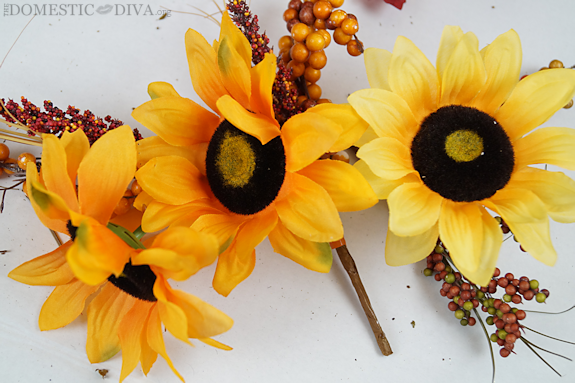 Next, attach the finished bow to the top of your fall wreath with the excess floral wire we had left earlier. To make the tails of our burlap bow a bit prettier, all I did was cut a “V” shape at the end of each one. How cute is this finished wreath? I found it best to hang this wreath on our front door with a metal wreath hanger that I found at Walmart. This wreath definitely reminds me of my favorite season. 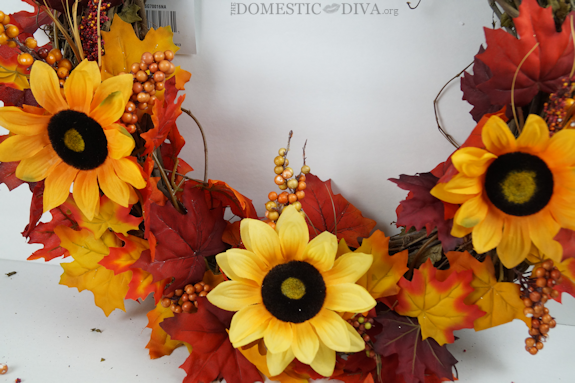 Looking for more Fall themed projects? 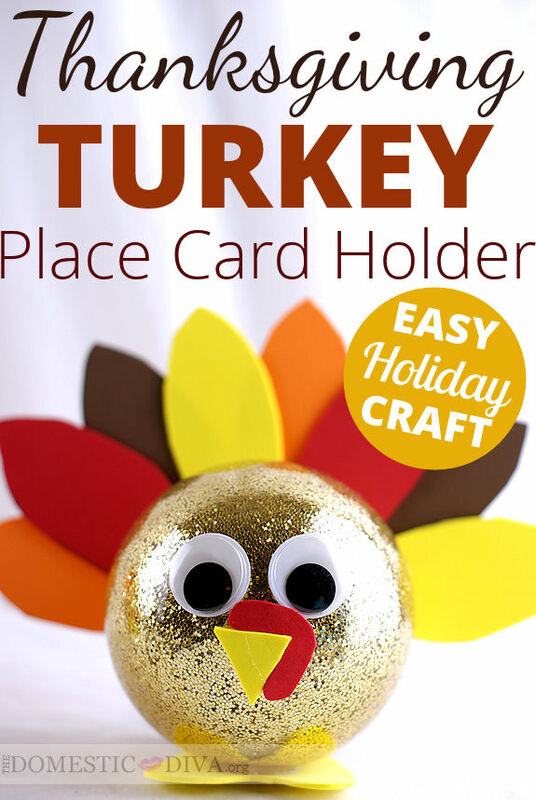 Check out these adorable turkey place card holder that you can make out of clear ornaments! Disclosure: As a participant in the Walmart Moms Program, I was compensated for my time and efforts in creating this post. All thoughts and opinions are my own. My experience may differ from your own. Hi, I just found your cute website! 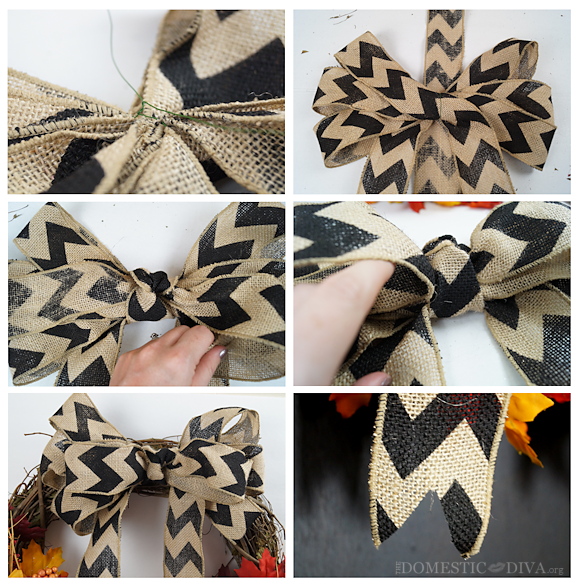 I’m wondering how much (inches) of the burlap ribbon you used for your beautiful bow? The spool of ribbon was 5 yards in length, I used most if not all of it to make a very large bow for this wreath.